Kelsey Lefever was starting to panic. Less than a week earlier, on May 16, 2011, four retired Thoroughbreds the then 23-year-old horse trainer and broker was entrusted to find good homes for were discovered in the trailer of a known kill buyer at the New Holland horse auction in Lancaster County, Pa.
Lefever sent a text message on May 20 to Amy Groninger, her friend of four years said, suggesting they tell anyone who asks that a third woman took the four horses from Lefever. That person and not Lefever, the story went, sent the horses to New Holland, where lip tattoos were checked by Sonja Meadows, a director of Maryland-based Animal's Angels who passed the information on to Deborah Jones of Thoroughbred Identification, Protection, and Advocacy in California. Jones called Kevin Patterson, who owned and trained Beau Jaques for several years until an injury ended the son of Straight Man's career. Patterson said he had given the nine-time winner to Lefever along with $200 and 10 bags of horse feed a few days earlier after Lefever told Patterson she would be able to find the 6-year-old gelding a good home. 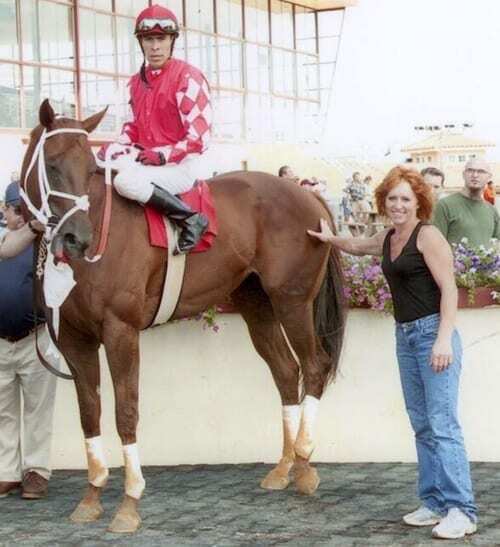 When he learned Beau Jaques had probably already been killed and butchered in Canada, an irate Patterson contacted Jeffrey Cassel of the Pennsylvania Horse Racing Commission, who advised him to call the Pennsylvania State Police. Trooper Colleen J. Shelly was assigned the case. “Pls call me I'm panicking,” read the message on Groninger's phone from a number she identified as that of Lefever. Groninger was supposed to adopt Beau Jaques – one of the four horses that were given to Lefever to re-home a week earlier – in exchange for another horse Groninger previously acquired from Lefever that wasn't working out. But Groninger lost her chance to adopt Beau Jaques when she went out of town during the time the horse was sent to the kill auction. Lefever allegedly told Groninger she would waive the sale price of the other horse if Groninger helped her defuse the situation involving Beau Jaques. On Nov. 16, Lefever, a resident of Honeybrook, Pa., was charged by the Commonwealth of Pennsylvania with three felonies and two misdemeanors in connection with the case: one count of deceptive business practices (Grade 3 felony) and four counts of theft by deception (two of them Grade 3 felonies, two of them Grade 1 misdemeanors). Lefever was released on $20,000 bail and is awaiting a Feb. 6 preliminary hearing in Dauphin County District Court. MAKE YOUR SLOW RACEHORSE COUNT! Kevin Patterson said he began looking for a good home for Beau Jaques after the horse injured a tendon while finishing third in a $5,000 claiming race at Charles Town in West Virginia March 29, 2011. Patterson subsequently spent approximately $1,000 in vet bills to treat the tendon injury though he didn't want to risk racing Beau Jaques again. Lefever was recommended to Patterson by another trainer at Penn National in Grantsville, Pa., and he heard positive things from other horsemen about her efforts to retrain and re-home ex-racehorses. On May 13, according to Trooper Shelly's Affidavit of Probable Cause, Patterson and Amy Albright, his fiancée, met with Lefever in the Penn National racecourse receiving barn and discussed what type of new career Beau Jaques might have. Patterson said Lefever told him the horse would “make a good hunter or jumper,” and he responded that if she needed more money (in addition to the $200 and horse feed he already had given her) to help care for Beau Jaques while she found a new home for him, he would be happy to do so. He also said if things did not work out, he would be glad to take Beau Jaques back. According to Patterson, Lefever inquired if the horse “had anything in him” (medication). Beau Jaques had only recently been treated with penicillin, phenylbutazone, and naproxen, Patterson told Lefever. At the time, Patterson thought Lefever asked about drugs because Beau Jaques was such a quiet horse and she must have wondered if he had been tranquilized. When he learned the fate of Beau Jaques, however, he said he believed Lefever asked the question because of the restrictions on medication in horses slaughtered for human consumption. Patterson said Lefever provided him with items promoting her business, including ink pens and a coffee mug that said “Make Your Slow Racehorse Count!” and “Finding New Homes for OTTBs” (an acronym for off-track Thoroughbreds). Albright confirmed the meeting to the state trooper, adding that Lefever told Patterson she would never sell Beau Jaques for slaughter, something Patterson and Albright said they were adamantly against. After she and Patterson learned that Beau Jaques ended up in the hands of a kill buyer at New Holland, Albright tried to find out from Lefever what happened, but Lefever wouldn't talk to her. FROM A FAMILY OF KILL BUYERS? Horse owner Mark C. Bliss was identified by Trooper Shelly as victim number two in the case against Lefever. Bliss said he turned over three horses to Lefever on or about May 13, 2011, after he was convinced she had a legitimate business training horses for second careers. The three horses, identified with the help of Deborah Jones and additional investigation, were Magickylie, a three-time winner whose last start was March 19 at Mountaineer Park in West Virginia; Marek's Czech, who won two of 22 starts and last raced Feb. 9 at Charles Town; and Lion R Ess VP, one for 15 and last raced at Penn National April 5. Bliss owned the latter two in the name of his Twenty Twenty Stable, while Magickylie was owned and trained by Jerry Norwood, who asked Bliss to find a home for the horse that would keep him out of “harm's way” – in other words, a kill auction and slaughter plant. Norwood has since died, according to the affidavit of probable cause. Bliss said Lefever told him she never takes horses to kill auctions and always finds them a good home. There were, however, some skeptics like Tera Schauer of the Happy Tails Holistic Rescue Rehabilitation and Sanctuary in Paxinos, Pa. Schauer was concerned that Lefever was posting an unusually high number of ex-racehorses for sale on her Facebook page and noticed that when someone posed a question about one of the horses, Lefever would reply that the horse was gone. Deborah Jones in California notifed Schauer that Lefever had claimed to be fostering horses on behalf of Schauer's rescue, Happy Tails. Several weeks before the Beau Jaques incident when Schauer talked with Lefever – who she said had been portraying herself as someone working to save the lives of horses and rehome them – Lefever said she had grown up in a family of horse dealers and kill buyers and had even dated a kill buyer at one time. Schauer said Lefever told her she had undergone a transformation and now wanted to save horses from slaughter. Bruce Rotz, who is under contract to buy horses for the Canadian meat company Viande Richelieu, confirmed to Trooper Shelly the four horses in his trailer May 16 – Beau Jaques, Magickylie, Marek's Czech, and Lion R Ess VP – were sold for slaughter. According to Rotz, a New Holland Horse Auction employee named John Whiteside put the horses in his trailer thereby avoiding them being sold through the auction ring, where it was more likely they would be identified as recently-raced Thoroughbreds. Many racetracks, including Penn National, have adopted rules in recent years punishing owners and trainers of horses that ended up at kill auctions. Anti-slaughter critics have said the tracks are not stringently enforcing those rules, however, and kill auctions help avoid detection of the ex-racehorses when they are sold privately. On July 18, Trooper Shelly visited the New Holland auction to speak with Whiteside, but upon her arrival she observed Kelsey Lefever drive past in a pick-up truck pulling a horse trailer. The state trooper asked Lefever about the four horses found at New Holland in May, and Lefever denied sending them to slaughter. She also said that while she always gets contracts for horses she buys and sells, in this instance an unknown woman “showed up” at her barn and bought the horses. Lefever said she didn't know who the woman was. If this mystery woman who supposedly bought the four horses from Lefever does exist, why did she turn around and sell them to New Holland auction employee John Whiteside? If so, did Whiteside pay cash for the horses or write a check? Maybe he at least got the woman's name. Also not answered in the affidavit of probable cause is an explanation of how Lefever had such ready access to the secured stable area of Penn National. One trainer who spoke to the Paulick Report on the condition of anonymity said Lefever was a regular visitor to the track, bringing her truck and trailer to the stable area despite not being licensed in any capacity by the Pennsylvania Horse Racing Commission. The trainer wondered how Lefever was allowed such access when security guards stringently require licensed personnel to display their badges. Call and emails to Chris McErlean, vice president-racing for Penn National – asking whether Lefever is still allowed in the stable area and if Penn National has revised its security procedures – were not returned. Lefever did not return a message left on her phone from the Paulick Report. New to the Paulick Report? Click here to sign up for our daily email newsletter to keep up on this other stories happening in the Thoroughbred industry. This entry was posted in Ray's Paddock and tagged Amy Albright, Amy Groninger, Beau Jaques, Bruce Rotz, chris mcerlean, Horse Racing, John Whiteside, Kelsey Lefever, Kevin Patterson, Mark Bliss, new holland auction, Paulick Report, Penn National Race Course, pennsylvania horse racing, Pennsylvania State Police, thoroughbred, Thoroughbred aftercare, thoroughbred rescue, thoroughbred retirement, thoroughbred slaughter, Trooper Colleen Shelly, Viande Richelieu by Ray Paulick. Bookmark the permalink.